Corsair has launched an all new gaming chair line with the new T2 Road Warrior. The new chair is created for long-term comfort and is finished in “premium perforated PU leather”. Corsair will be providing the T2 Road Warrior with a choice of five different colour accents. In an email to HEXUS, Corsair added that it has simultaneously released an updated version of its performance motorsport inspired T1 Race gaming chair, a 2018 edition. This is a comfortable and sturdy chair. As well as the Padded PU finish mentioned above it has neck and lumbar pillows for added support, wrapped in soft microfibre fabric. Adjustability raises your comfort level too; Corsair’s T2 Road Warrior offers eight adjustable parameters including its 4D armrests, seat base adjustment of up to 17° of tilt, seat back recline of up to 170°, a class 4 gas lift providing 100mm of height adjustment, as well as 360° of rotation. Corsair says it has constructed the chair frame with a solid steel skeleton and it features a cast aluminium five-spoke base. Its rollerblade-style wheels ensure smooth movement on most floors, including carpet. It is said to be easy to assemble, without tools, and Corsair has produced a two minute assembly help video. The motorsport inspired Corsair T1 Race gaming chair uses the same PU leather and similar colour highlighting (five colour options) of the T2 Road Warrior, detailed above. Additionally it comes with colour-coordinated automotive detail stitching, according to the press release we received. Detachable microfiber fabric neck and lumbar pillows are provided for greater comfort options. Other comfort-enhancing features include the; 85mm of vertical movement and 180° of recline. The Corsair T1 Race gaming chair is a cheaper option than its sibling the T2 Race. Compared to the T2, the new T1 2018 edition has ABD rather than aluminium base, is rated for max 120Kg rather than 140Kg, and lacks seat pan tilt adjustment. However, both Corsair Race edition chairs share the rollerblade-style wheels and easy to assemble qualities of the new T2 Road Warrior. The new T2 Road Warrior and T1 Race gaming chairs are available immediately from the Corsair retailers and distributors worldwide, as well as direct from the www.corsair.com webstore. In the UK the Corsair T2 Road Warrior is listed at £399 inc VAT, and the Corsair T1 Race is £349. This is getting silly, £3-400 chairs that are fake leather. I got a real leather operators chair for £80 (was 1/2 price but I would still pay the £160 over 3-400 for pleather). Bob: So, we have a new gaming chair in the works. It's sort of like our first model, only with more comfort in mind. You know, more padding, wider seat, leather upholstered etc. Rob: Okay. So what's the problem? Bob: We're having trouble coming up with a name. Something that says comfort, premium feel, gaming in luxury. Rob: Ah, that's a tough one. Rob: How about ROAD WARRIOR!!! Bob: … Rob, you're a goddamn genius! Marg! Wheel in the cake trolley, we're done here. 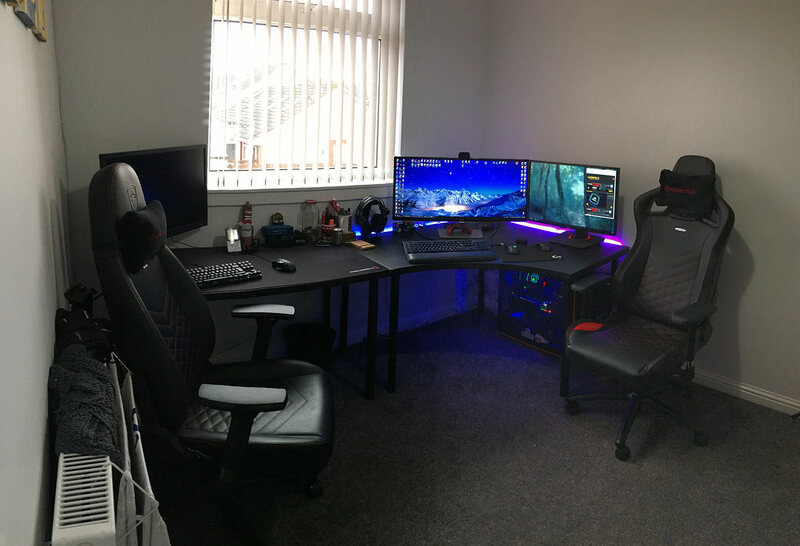 I have a noblechairs ICON and a noblechairs EPIC, both in the £300-£400 range, both PU “leather”. Having said that, what's wrong with spending £300 on a chair that you might use every single day? Some people spend more than twice that on a graphics card that will be outdated within 2 years.